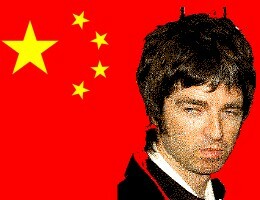 By DJ Salinger, SHANGHAI – China’s official news service (China’s Official News Service) is reporting this morning that British pop singing sensation Noel Gallagher may have quit Oasis, the world’s most popular shock-rock combo since The Beatles. “Mr Noel doesn’t like his brother, and wants to experience a middling solo career apart from him (the brother),” said Dan Hartwig, spokesperson for CONS. “It’s just like when Paul quit The Beatles,” he speculated wildly. Angry fans turned over cars and houses. Looting continued worldwide. One lady, Ms Norma Hall, 42, used the ensuing chaos as an op to abandon her moral conscience. “I got drunk , put on an Halloween mask and went online,” she said, vaguely. Turkey, Japan and Canada had reported like a while ago that Gallagher, known for his boyish resemblance to The Beatles and vegetarian diet, had jumped ship. Canada reported Gallagher had joined 80’s singing sensation Styx, in November. “Canadian news is lies, basically,” ejaculated Ray Goolens, refusing to give his age lest it interfere with picking up. “China is the best country, and we should all follow their shining example in everything,” he went on. CONS employs 2 billion university educated journalists. Their unceasing pursuit of truth is inspiring and nice. This entry was posted in Thinking Man's Rock and tagged china, CONS, dj salinger, noel gallagher, oasis, ray goolens, shanghai, shock rock, the beatles, the brutal times, Thinking Man's Rock. Bookmark the permalink. dont say a bad thing about china!